On Friday, Marjorie presented a workshop at Teachers College on vocabulary acquisition with Ken Pransky. Ken is the author of Beneath the Surface: The Hidden Realities of Teaching Culturally and Linguistically Diverse Young Learners K-6 (https://www.heinemann.com/products/E01202.aspx ) and My Fantastic Word Book: Young Student Thesaurus. The student thesaurus is a wonderful resource for vocabulary acquisition that uses graphics, font size and pictures (the key elements of any good chart) to illustrate useful vocabulary. The words are clustered by meaning or placed on a continuum to show gradations of intensity. The book is currently only available through the Collaborative for Educational Services (collaborative.org), but will also be available from Amazon soon. Teaching academic vocabulary, or the vocabulary of school, is something every teacher pays attention to, but is often an area of concern, and even frustration, when students don’t seem to internalize and use the words taught each and every week. While immersion is important, it is not enough because the teacher is doing most of the work. Ken Pransky advises teachers, “Never work harder than your students!” and this could not be more true than when it comes to teaching vocabulary. Just think about how much time you spend choosing words, making worksheets, designing crossword puzzles, and grading spelling tests. What are the kids doing? Often they are the passive receivers of all this information, not active participants or creators. In Smarter Charts we talk about the power of visuals, or the picture superiority effect, for enhancing recall beyond that of words alone, especially when exposure time is limited (and in schools, time is always limited!). Using limited, but strong graphic elements like bolding, font size, and symbols can also make information compelling and memorable. 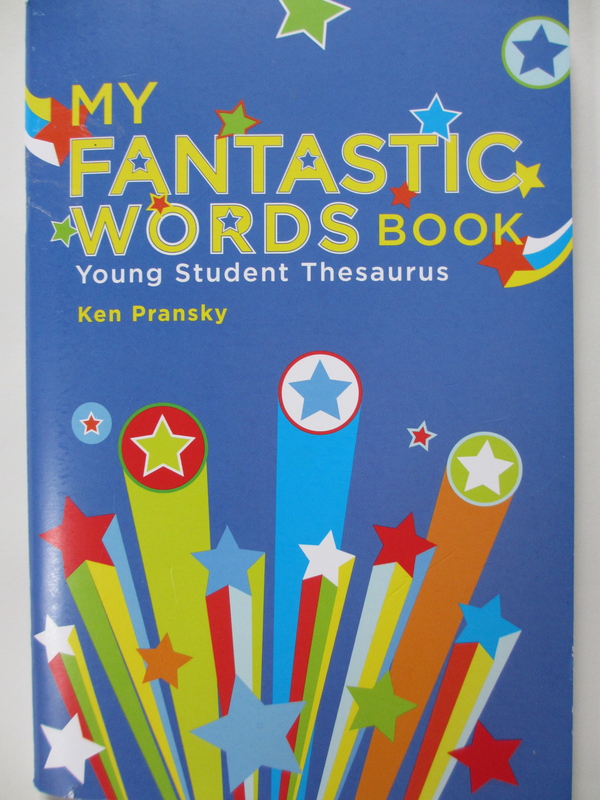 This is why we are so excited by Ken’s My Fantastic Word Book. It makes use of all of these elements to show children how to expand upon overly used adjectives and verbs. 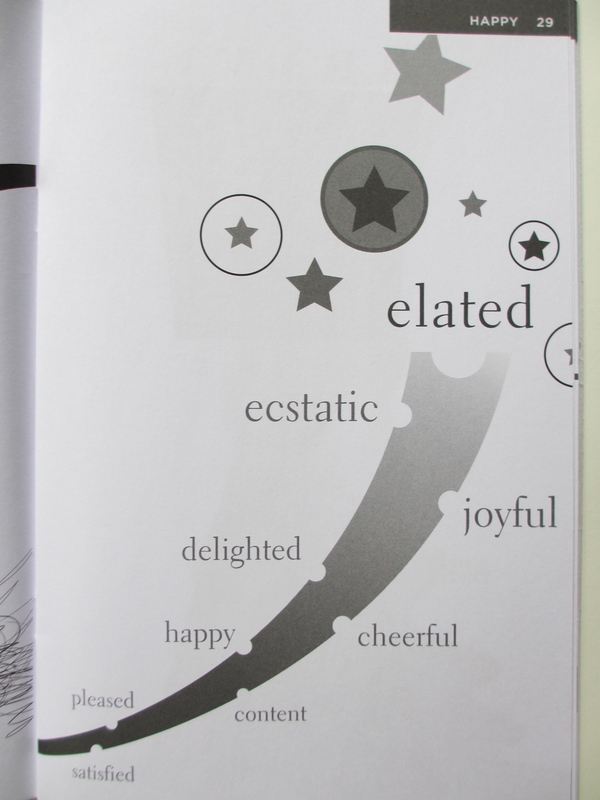 An example of words that describe from My Fantastic Words Book by Ken Pransky. We read between the lines. What can we figure out? What are these words about? 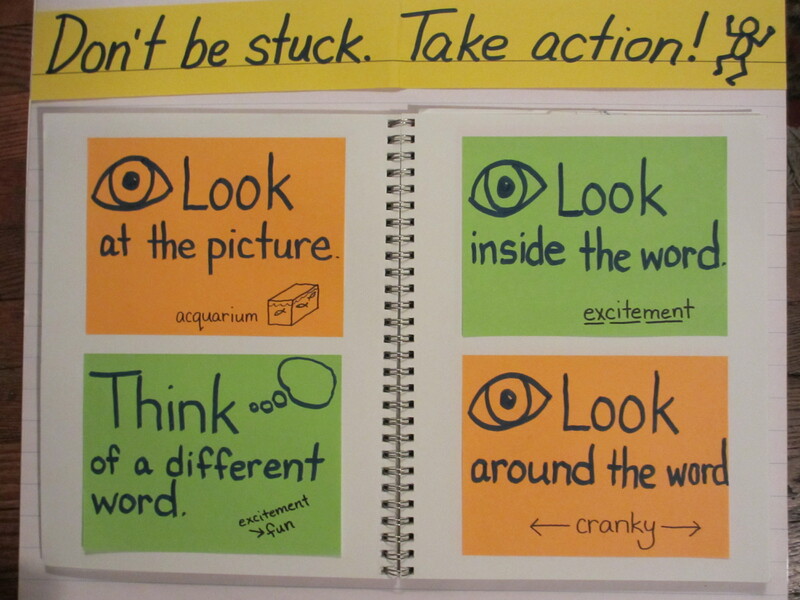 Charts can support the teaching of vocabulary by making a visual record of what is being taught and learned. Reading aloud picture books and chapter books is a great way to highlight the power of vocabulary to impact readers, whether narrative or informational, and to anticipate what will be needed to strengthen children’s reading and writing. 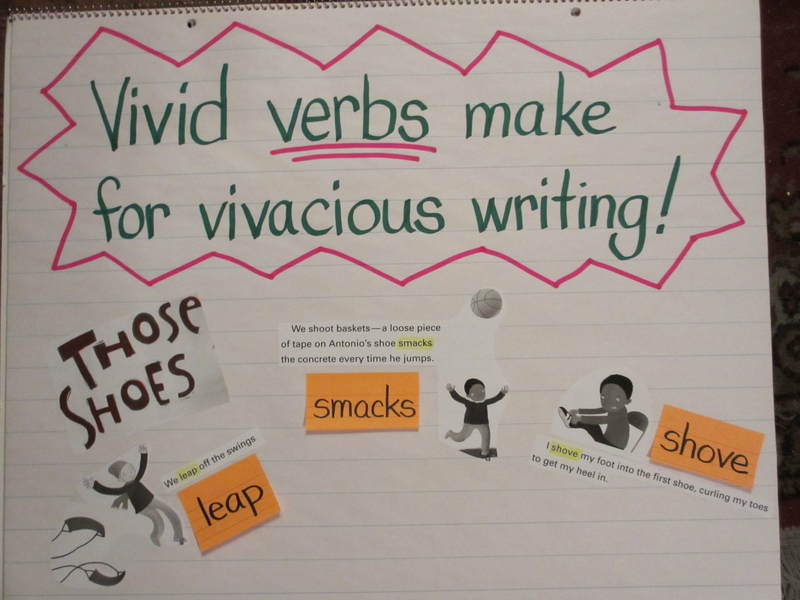 For example, we often find young writers using very passive verbs in their writing, like “I went to the park” or “I was eating pizza.” So teaching vivid verbs might become one possible vocabulary focus when reading aloud. The chart below is the start of a chart showing three verbs the teacher and the students noticed upon a second reading of Those Shoes by Maribeth Boelts. They talked about how the words were used and what the words meant. Then the students were asked to be on the lookout for these words across the day – when they saw them or used them when reading, writing, or talking. One thing that ended up being discussed was how certain words showed up more often or were used more often than others. Using the words when talking is extremely important as a precursor to using the words in writing. Shared reading is another component of balanced literacy that can be used to highlight vocabulary and show ways to develop word meanings. One thing that Ken Pransky pointed out was that when teaching children to use context clues to figure out a word, the text should be at a just right level. In other words, children should know 18-19 out of 20 words before having them guess meaning from context. Below are some examples from big books where this has been done during shared reading. The teacher, Kelly Holt, returned to some words that her children did not seem to understand clearly. 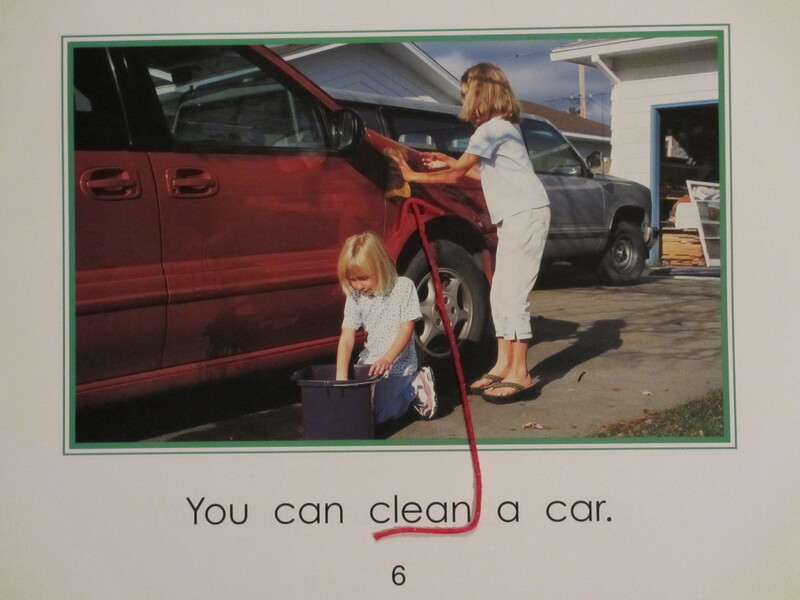 For example, on the page that said, “You can clean a car.” the children kept saying “wash” instead of “clean.” In this case, it was the syntax, more than the meaning, that seemed to cause some confusion. The teacher used a wikki stix to highlight the word and point to the clue in the picture to show how to figure out what the author meant. Using the picture to help understand the use of the word ‘clean’ in this sentence. On another page, it was the meaning of the word that was unfamiliar. Most children had never gone snorkeling or if they had ever seen a snorkel, did not know what it was called. In this case, the teacher was teaching the name of something, but it is not a vocabulary word that is high on the list of important nouns to learn. 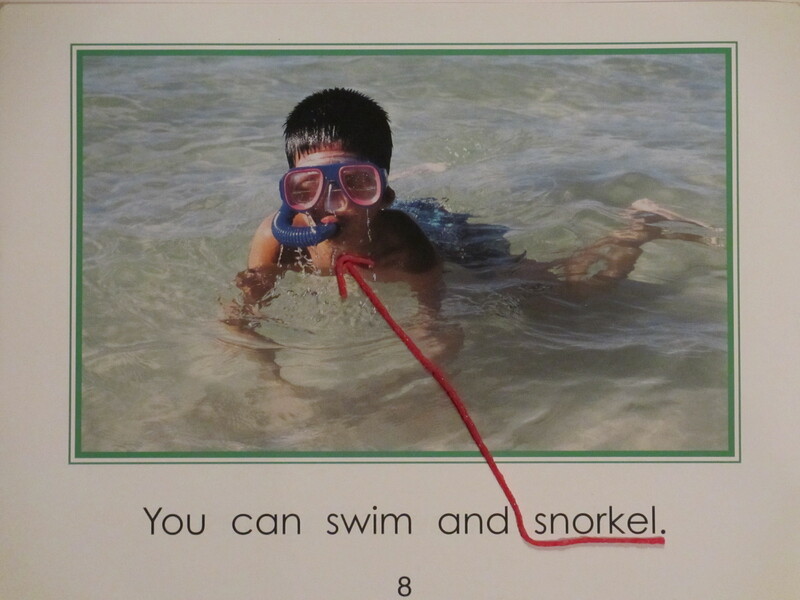 The red line connects the word ‘snorkel’ with the picture of a snorkel. In a second grade classroom, shared reading was used to show children how to use a glossary to figure out word meanings, but to add to it using their own words. 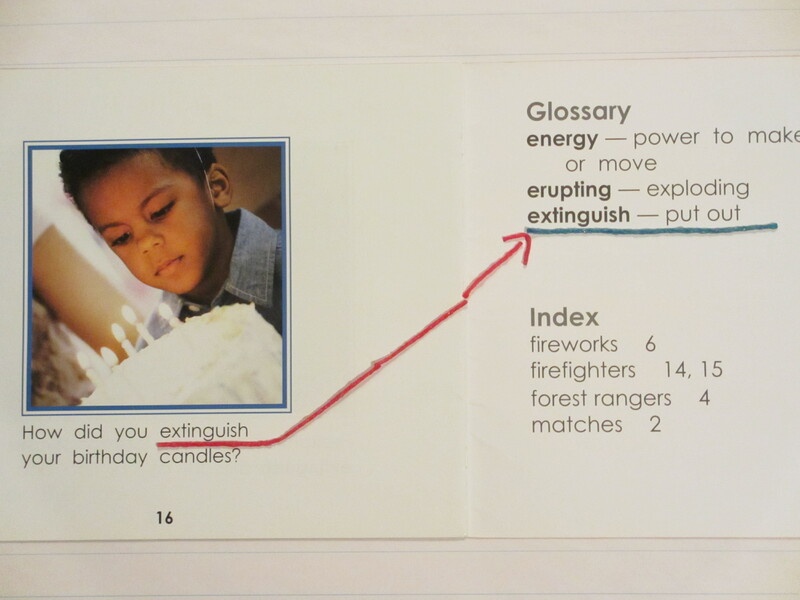 In the case of the word extinguish, the glossary defined the word as “to put out.” The children used the picture to add to that definition, saying “to blow out.” Using their own words and understandings helps them to take more ownership of the word. Interactive writing is another component that can help children become more confident vocabulary users. We often find that children may use certain vocabulary in their spoken language, but don’t use the words in their writing. This is often because they are insecure about the spelling and afraid to take risks. Interactive writing provides a nice scaffold and a safe place to try things out in a risk-free environment. Returning to a familiar big book is a nice way to revisit word choice and consider alternatives. 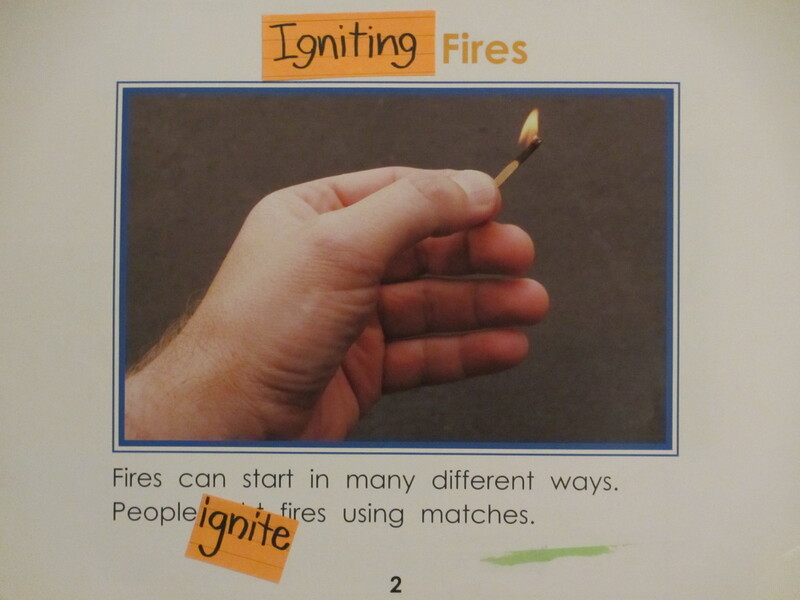 In the book, Fire, illustrated above, the class thought about how information book writers often use very specific vocabulary words when teaching about a subject. With this in mind the students decided to revise the heading of the first chapter, changing the word ‘light’ to the word ‘ignite’ which they had come across in other texts about fire. They also changed the word in the text as well, immediately lifting the level of text complexity. The kids also felt rather superior as a result. Interactive writing was used to capture the vocabulary revisions made by the students. Lastly, charts can be used to remind children of the many strategies they can call upon when trying to figure out the meaning of unknown words. Remember, these strategies will be most effective when the children are reading books that are within their zone of proximal development. The chart above was used often as the children came across words they did not know and were asked to share ways they figured out the meaning. 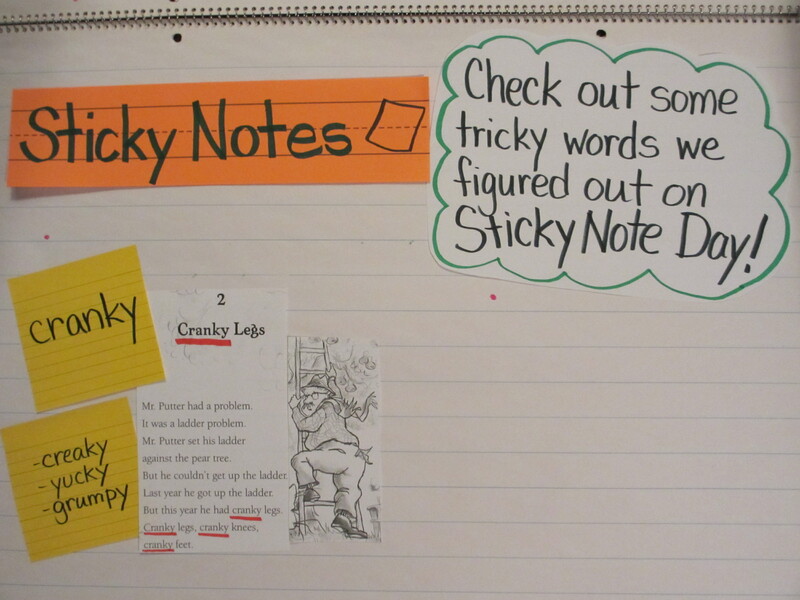 Jamie Mendelsohn at PS 59 M came up with the idea of having a “Sticky Note Day” every Friday with her group of second graders. Each child was given a sticky note and told to be on the lookout for a word they thought was particularly important to understanding the book they were reading. Towards the end of reading workshop they would get together with a partner and talk about why they thought the word was important and what they tried to figure it out. Then the whole class would get together and talk more about one or two of these words. This is the beginning of a chart that shows an example of how an unknown word was chosen and figured out. Once again, it is the children who are actively figuring out possible meanings of the words, not the teacher or a dictionary. Kids love being word detectives and feeling smarter as they come to own an increasingly larger amount of academic vocabulary. We hope to see many of you at the upcoming NCTE convention in Las Vegas. We will be signing copies of Smarter Charts at the Heinemann booth at 2 pm on Friday, November 16th. Great post! Totally usable – i’ll be bringing into my schools…even my middle schools! Lot of work if you have to make these charts yourself. But visuals do really work. Thanks for fun post.